On the Pack evening 1st October, we had arranged for a visit from a representative of Dogs for the Disabled to come and talk to the Pack. It was a lady called Karen Williams who brought her assistance dog Iggy. When Karen mentioned that we could sponsor a puppy for a year for £60 we decided to invite family and friends along also, thus turning it into a mini fundraising evening to see if we could reach our £60 target. Karen, along with her Personal Assistant Sue, gave a very interesting and informative talk about the work of the Dogs for the Disabled and also an insight into how suitable dogs are selected for training and what the training comprised of. Iggy then gave some demonstrations of what he did for Karen including picking up things for her, fetching her notebook, and assisting her when she was out in her wheelchair. 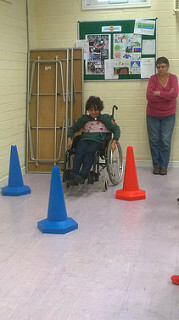 Some of the Cubs were also able to experience what it was like being a wheelchair user, including having to propel themselves around a short obstacle course. Thanks to donations from refreshments served, the proceeds of a small raffle, and donations given by parents who couldn’t attend the evening, we raised a total of £64. We have now received a Certificate to say the Pack has sponsored a German Shepherd cross Golden Retriever puppy called Ralph for the next year and we will be receiving regular reports of how Ralph’s training is progressing. Ralph looks a lovable rogue from his photo – just like some of our Cubs!